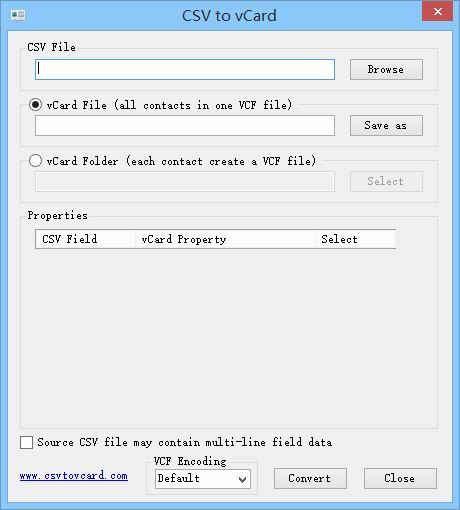 CSV to vCard is a free contacts file converter, it can convert contacts files in CSV format to vCard files. 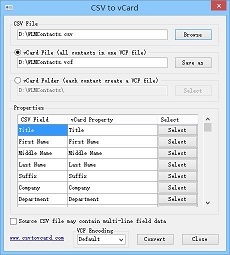 The usage is simple, click the button "Browse" to select a contacts file (*.csv), program will read all contacts fields and data, then you need set vCard property for each CSV field. After you have set all fields that you need, click the button "Convert" to generate a vCard file, the output file extension is *.vcf or *.vcard, default file extension is *.vcf, so you can think of this program as a csv to vcf file converter. Additionally, if all fields in your contacts CSV file are in English, program can auto-fill correct vCard properties, such as First Name, Last Name, Job Title and more. Also, for some common fields, program can automatically map it to corresponding vCard properties (synonyms words), such as Family Name to Last Name, Occupation to Job Title, Web Page to Website, and more. Please note that not all contacts fields are supported, currently, program supports the most important fields. Furthermore, the generated file is in vCard version 3.0 (RFC 2425) format. The CSV (comma-separated values) format is a common file type used in transferring data, many Internet mails and Email clients can export contacts (address book) to a CSV file. The vCard is an electronic business card, it is used as a variety of applications and mobile devices, by using vCard file, contacts information can be exported and imported. 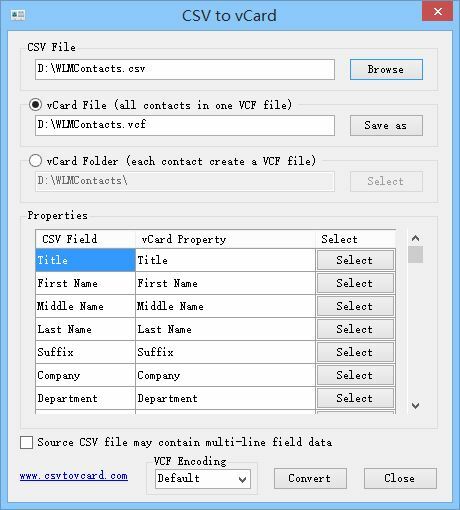 This software is bridge to transfer your CSV contacts file to vCard files, just a few clicks of the mouse, it can help you to complete the conversion. Copyright © CSVTOVCARD.COM, All Rights Reserved.